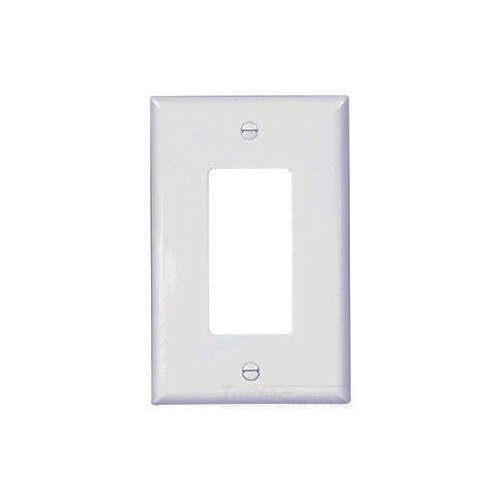 Cooper Wiring Device 1-Gang Midway size wallplate in white color, features impact-resistant polycarbonate construction with high gloss finish for soil resistance. Rectangle wallplate measures 3.12-Inch x 4.87-Inch. Screw mountable wallplate has one decorator/GFCI configuration. It withstands temperature rating of -40 to 70 deg C. Wallplate comes with matching mounting screws. It is UL94 5-Volt flammability rated to withstand harsh environmental conditions. Wallplate is cULus listed and CSA certified.